George Graham Reviews Katzenjammer's "Le Pop"
Regular listeners know that for me, musical eclecticism is a big asset. Sometimes that mixture of disparate sounds and styles can serve to add a little spice to what might otherwise be familiar. Sometimes the influence-mixing is more integral to the music, with the group's sound relying more on the aggregation of ingredients. And sometimes, eclecticism becomes an end in itself, music reveling in throwing together the most unlikely combinations to see what comes out. Recently, it seems that there is more of the latter, perhaps as a reaction to the homogeneity and artifice of a lot of contemporary commercial music. And this week, we have a great example of musical eclecticism with wild abandon. It's the newly released debut album by a group called Katzenjammer, named Le Pop. Named after the one of the first comic strips, the Katzenjammer Kids, Katzenjammer [pronounced "katzenyammer"], as they call themselves, are a quartet of women from Norway, who among them play at least 29 instruments regularly on stage. They draw on a dizzying array of influences, most of them pre-rock, including Eastern European sounds like Klezmer and Gypsy music, along with cabaret and pre-World-War-II theater music, some Norwegian folk songs, a smattering rock and punk, and maybe a hint of chanteuse-style ballads. The members, Solveig Heilo, Anna Marit Berghein, Turid Jorgensen, and Marianne Sveen, are quoted as saying that they specifically set out to play instruments that they had not played before, and on stage, and even in the studio, they often swap instruments among themselves. Almost nothing they play is electric -- the exception being some keyboards like a vintage mellotron. Katenjammer's music is all original, though a lot of it sounds as if it came from a curious time warp of the 1930s with hints of 1980s alternative rock. They sing in English, though sometimes their lyrics are a little cryptic. But it's lots of fun right from the start. While the group is largely self-contained on the CD with the four members playing so many instruments, there are a few additional players brought in for incidental parts, such as sitar and pipe organ. Among the array of things that Katzenjammer play are banjo, washboard, trumpet, contrabass balalaika, accordion and glockenspeil. Despite the members' taking up instruments that they had not previously played, the musicianship is first rate. The members are excellent all-around on whatever they play, and are good vocalists. With all that interesting and sometimes ethnic instrumentation, one would think that the music could turn into an academic exercise, but Katzenjammer are out to have fun. "Wild abandon" is the phrase that comes to mind. 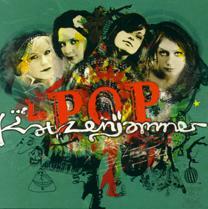 Le Pop the newly released CD by Katzenjammer, is a most entertaining album. The four members plunge into eclecticism for all its worth and succeed remarkably well, throwing stylistic ingredients together with a vengeance, and having an infectiously good time in the process, while also maintaining an impressively high musical standard. This recording was originally released in Norway in 2008, but since then they, have been gaining increasing notoriety and touring worldwide, appearing at the American Bonaroo festival, so an American record label picked up their CD, and gave it much wider distribution. Katzenjammer will be coming again to the US, appearing as part of the Lilith Fair tour. Our sound quality grade for Le Pop is about an A-minus. The motley collection of instruments were recorded well, and the studio process is not allowed to interfere with this group's personal energy. Dynamic range is good in spots -- there are some effective transitions from soft to loud for example, but in others areas, the sound is overly-compressed to the point of near-distortion. These days musical stereotypes are pretty much out the window. People playing styles associated with a region or an era are as likely as not to come from someplace far removed or be of a different generation. But given all that, these four young Norwegian women defy all expectations and come up with maximally eclectic music that's as impressive as it is fun.